Her name is Amy J.
and take a look at some of the free printables she has on her blog! ♥ psalm one-thirty nine. fourteen. with much love & gladness in my heart! Oh my! What beautiful goodies ~ I can't wait to go visit Amy's shop. Thanks for the chance! Oh my I am so loving this dress garland! I love your sweet blog too though I don't comment often- thank you for the lovely giveaway! I'm a new reader here and have fallen in love with your blog - so inspiring! I'm sure I'll spend today falling in love with Amy's blog - good thing we are on blizzard watch here in MA and I don't have to go anywhere!! What a sweet shop & blog she has! Thanks for sharing! And I would LOVE one of these garlands for my sweet Sarah!! Always love your stuff Jaime! Just beautiful. Thank you for sharing. I am headed to the Etsy shop right now! I would love to win a dress garland. I know a special little girl and that would make the most awesome decoration for a special get together!! 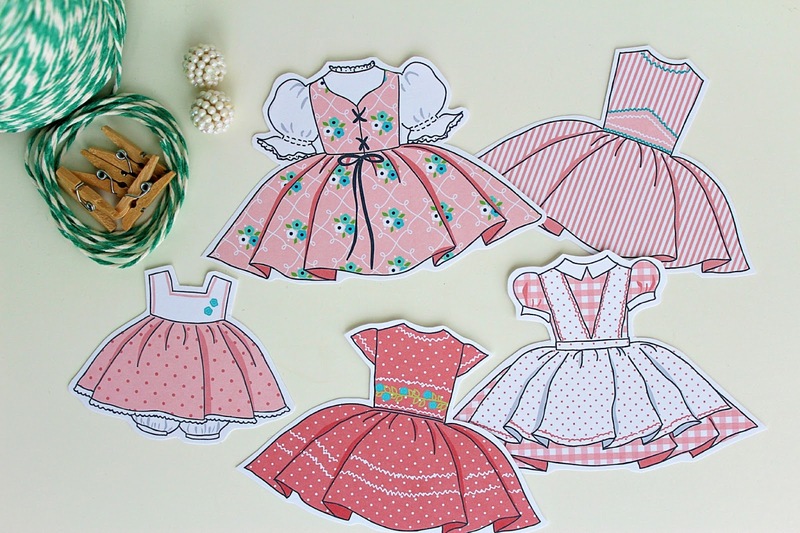 Oh goodness ... those little dresses are adorable! Thank you for the chance to win ... now I'm off to visit Amy's blog. How sweet! I would love these to hang up in my sewing room! In a house full of men, I need something cute and girly! so nice and very very girly. love them all!!! I love her work and love those dress garlands! They are perfect! Oh I know a sweet girl with a birthday coming up. Her momma would love this! I would love to win it for them. Beautiful!! I would love to win these for my friend who just had her first baby girl who was born with a heart defect that will require surgery - this would be such a wonderful and beautiful reminder to hang in her nursery! My goodness, these are the most adorable little dresses. Very vintage. Thanks for the giveaway. I love these!! I'm new to your blog! Thanks for doing the giveaway!! Oh Jaime you know I would LOVE to win one of your precious garlands!! I already favorited it in my etsy favorites yesterday!! THANKS for the chance. 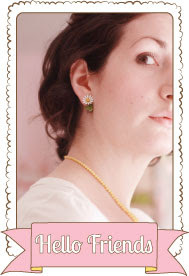 Did you ever notice how your friend Amy J. kinda looks like you in that photo she has on her blog and up on your post? Maybe it's just me!! LOL Take care sweet girl. XOXO Love Fran. What lovely, lovely little things! Love! I'm in love! These would be perfect in our all-girls upstairs! So sweet. seriously in awe of you jaime! such darling garland, thanks for the chance to win! Those are adorable! I love that verse too. 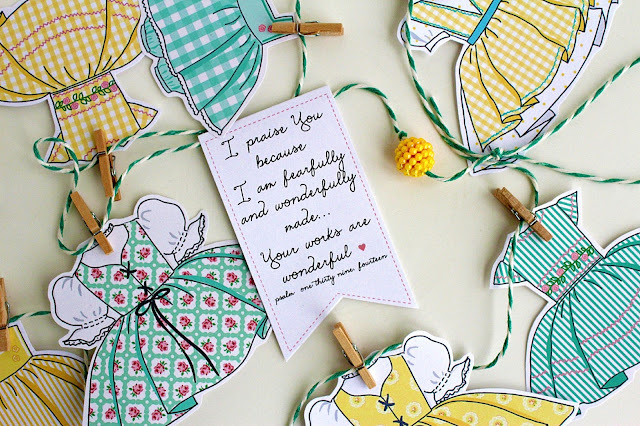 It is important to remind our girls they are wonderfully made by the Creator of the universe. Not a message they hear too often. Love these so much!!! I would love to hang one in my girls room! Thanks for the chance to win one! You are SUCH a gem, me dear! This garland would look fabulous in my 3 little girlies room, and if I don't win, I may just have to buy one from ya. You're a peach! As a mama of a lot of girls, I could just cry at how beautiful and meaningful the dress garlands are. Amy is incredibly, wonderfully, gifted. Thanks so much for sharing her shop. I think this is so sweet. And such an adorable addition to my two little girls room. Cuter than stinkin cute Jamie! I can think of a few little girls who would love these. These garlands are so cute! That is one if my favorite verses too! Love the garland and verse on it.....so pretty like everything in your shop. Thanks for this giveaway !! 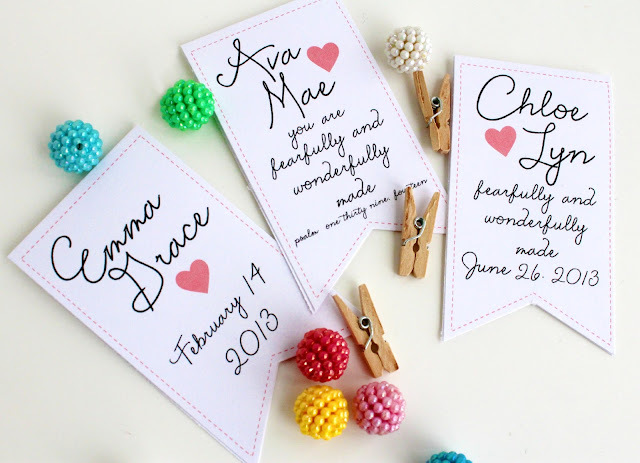 OMG - those garlands are so super sweet! I hope I am a lucky recipient of one of them :). 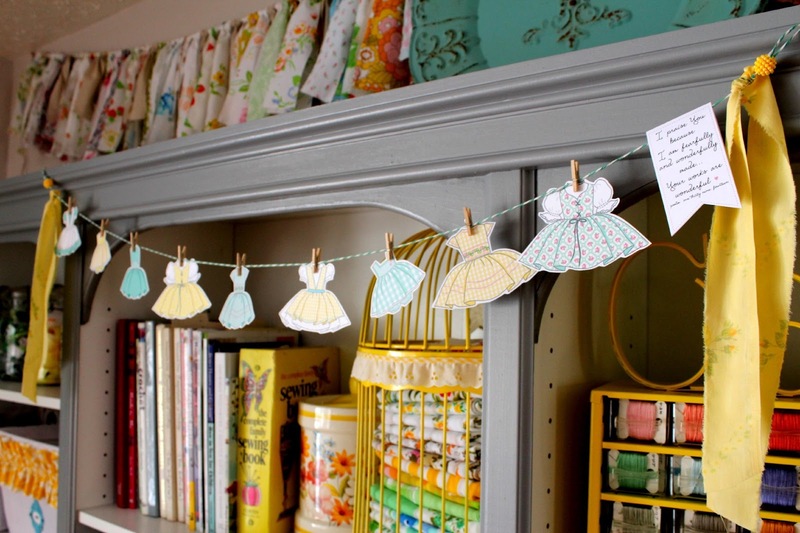 Ohhhhhh....just love these garlands...think individual dresses for cardmaking/scrapbooking will be fun too! I love those garlands. 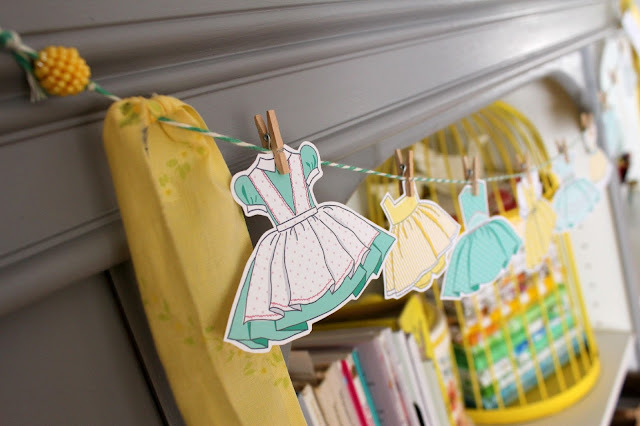 They would be so precious in my sewing room! Hi ! What a wonderfull little world ! Like so much ! In France we say : "Trop choupi". Here's my blog, you're welcome ! Ohhh!!! I just love them. Living in a house with all boys I love seeing girlie things. I hope I win and thanks for the great giveaway!!! I would love these they are beautiful, with 3 little girls and a baby on the way they would be so fun!!! I love Amy's blog and read it faithfully!!! Thank you for this giveaway! Her items are ADORABLE! I would love to use these things in my daughters' room. They are so cute! I love the baby announcements as I have one on the way! These are darling! What a wonderful idea and the added detail with the names and dates are precious. Thanks for sharing the site! 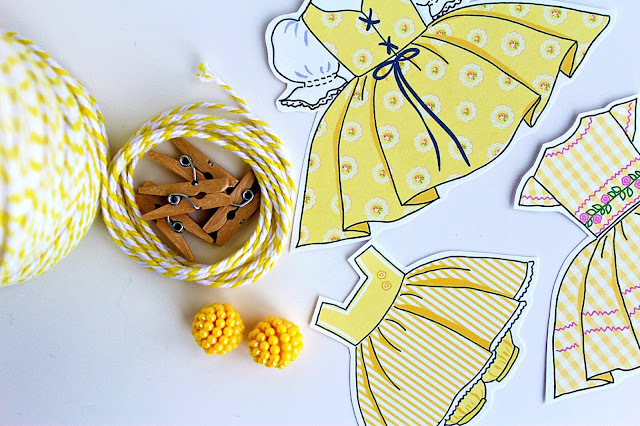 These dress garlands are pretty much the most adorable thing...well, EVER. Fingers and toes crossed that I might just be lucky enough to win! Wishing you a wonderful weekend sweet friend! I've loved these dress garlands since the first glimpse! They're so sweet! This is such a cute Etsy store. I'd love to win this garland. Thank you! OMG!!!!!!!!! I absolutely love these little dresses. 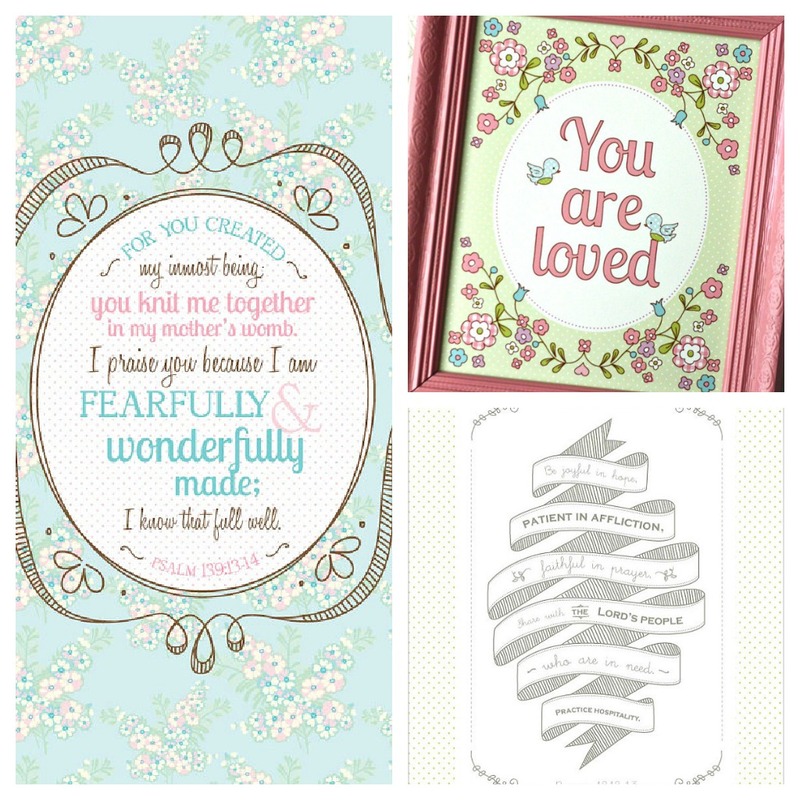 I want to hang these in my craft room. I think looking up and seeing these hanging would be wonderful inspiration. Thanks for the link to Amy J! Beautiful. I LOVE Amy J. 's etsy shop...I have a bunch of her prints and can never narrow down what I want next. Now I can add these dress garlands to my list :) I'm new to your blog, but I have really enjoyed browsing through it. I'll be back! I just started reading your blog....all the time I might add! 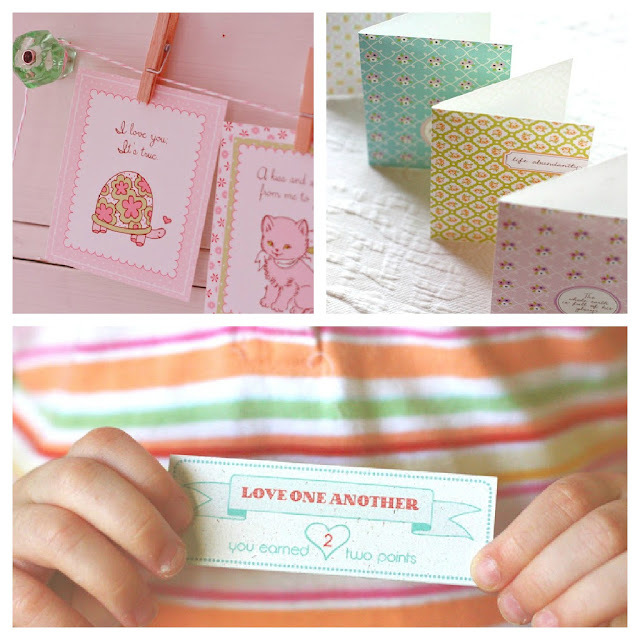 You are one creative lady with so many fabulous crafty ideas. I just painted my burgundy dining room white and am in the process of converting into a sweet craft room, thanks to your magazine article in BH&G. THANKS FOR INSPIRING ME! This garland is sooo cute...I love it! This is the sweetest thing! I've got to buy one if I don't get lucky enough to win...gotta have it for my craft room! I love these! What great design. Thanks so much for sharing! Really love both of your stuff. The dress garland is too cute!